The cars gathered at Bishops Lydeard ready for the ‘off’. Celebrity starting Marshall’s Tim and Audrey Lang give a cheery wave. They run a classic car business in Taunton. 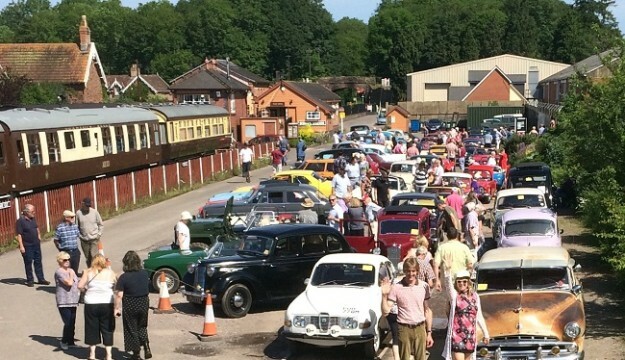 The West Somerset Railway’s annual classic car run from Bishops Lydeard to Minehead was held on Sunday 3 June 2018 in glorious sunshine. Run organiser Robin Moira White confirmed that 78 cars started the run. All reached the finish at Minehead Station where many stayed parked up for the afternoon. The next similar event will be the WSR’s Steam Fayre at Norton Fitzwarren on 4&5 August.